Ever need to know or understand your students better? Does your administration or state want to you collect more data or information than you have ever had to before? Are you sick and tired to collecting paper and pencil assessments (I’m sure you never misplace them)? Do you spend hours and hours sorting through all the papers to mark? It’s time to collect more information faster, give feedback quicker, and collect more data ever. I’ll let you in on a little secret. Google Forms will make your life easier, give feedback instantly, and collect more data than you ever thought and you will spend much less time doing all these things. Sounds great right! Just keep reading and I’ll show you how it can be done! In this first blog post, I showed you how to make a Google Form (after a few tries, you can make them really quickly). In this blog post, I’ll give you 15 different ideas on the best uses for Google Forms in education. By sharing my ideas, I hope it spark many more thoughts on how to use them in your classes. 1. Student Interest Form or Questionnaire – Use this type of a Google form at the beginning of the year to get to know your students, strengths, weaknesses, question what units they are interested in, or use it at the end of the quarter, semester, year to get feedback on how the class is going! Here are a few examples of what you will get back when using Google Forms. 2. Student Interest Forms for Health – Use this Google form at the beginning of the year to get to know your students, question what healthy habits they participate in, how they enjoy learning, and what they may need to improve on! 3. Peer, Self, or Teacher Assessments in PE – Use this type of a form for students or teachers to check their classes understanding of skills or strategies involved in your current physical education unit. Make sure you look at the summary of responses after each class to see what you may need to focus your teaching on in the upcoming lessons. Also remember that you can use this information to differentiate your upcoming lessons, by giving extensions to students that are excelling or by adapting lessons for students that are struggling during the unit. 4. Peer, Self, or Teacher Assessments in Health – Use this for students to check their thoughts on how they did on an assignment. Also you can use this for peers to assess student work (walking galleries, small group shares, etc). I like to use this for group work too. Each group members can assess their team. This way everyone has a chance to grade their group members and give me feedback on how they think everyone in their group did. You can do this throughout the project or at the end. 5. Celebration of Knowledge A.K.A a Quiz – Use Google Forms to take a short formative assessment to see how your students are progressing with their knowledge of the materials. I will often use a program called Flubaroo to grade and return the quiz by emailing students the results in less than 5 min with the push of a few buttons. 7. Watch a Flipped Video for an Upcoming Lesson – Use this type of a Google Form to share information you want your students to access outside of class time and get an understanding of their knowledge of the material by having them answer questions after watching the video. 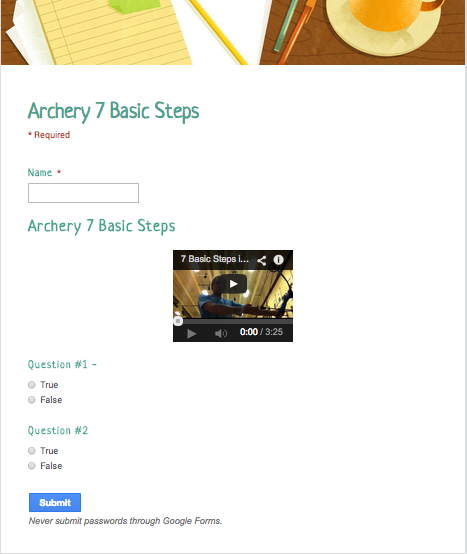 Archery flipped video quiz – with multiple choice questions. 8. Go Paperless and Eliminate Worksheets – This is a great way keep students accountable for work in your class. Maybe they are not even graded, but now you don’t have to make copies of all those worksheets! If you are a 1:1 school you can embed videos, pictures, and even articles to read within your Google Form too! It is amazing when you ask questions with Google Forms how honest and detailed your answers will be. I highly recommend using them just to collect any information needed. A journaling assignment that was much easier to assign and collect when it was shared electronically. 9. Collect Information for after school events – Use this form to see who is interested in participating in student activity nights, community runs, extra-curricular fitness opportunities, etc. 10. Unit Choices – Use this type of a form to poll your students on what their favorite units might be. You can also use it to have them choose between two units. 12. SLO’s for Educator Effectiveness – Use Google Forms to give your pre, mid, and post tests, plus all your formative assessments that lead up to the summative test. Flubaroo script grades (in minutes) and stores all the data in one place. This makes it easy to sort, compare, and analyze all the data you are collecting. This is a massive time saver for teachers that are already REALLY busy! 13. Teacher Feedback Form – Use this form to assess student work and give instant feedback with the use of the autoCrat Google Sheets Add On. Feedback includes canned comments, grades for each part of the rubric, overall comments, and a final grade. Each feedback sheet looks professional and is autoMagically emailed to the students instantly. 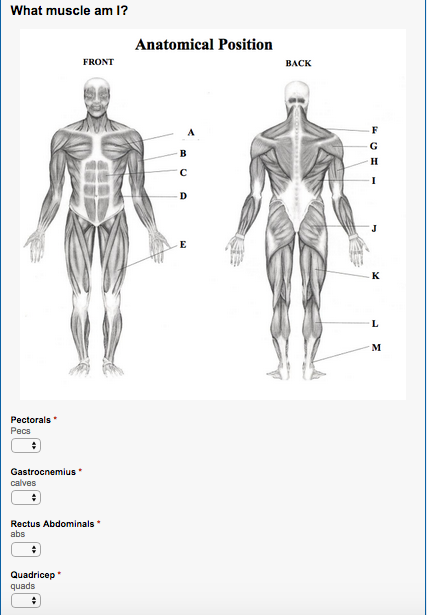 These are just some examples of how I have used Google Forms in health and physical education class. I have used many different forms from each variety or type of form that I listed here. There are so many more uses that I haven’t even tried yet, and I hope this post will spark your interest in creating Google Forms. I hope that you will also share the ways that you have used Google Forms or what you have created because you read this post! Thanks for reading. Attached below is a video of my Google Forms presentation, so if you would like to hear me describe any of these ideas in more detail, then feel free to check it out! Glad to hear that you liked the post! It’s nice to have students grade other students projects and then you can also grade during class. It sure can save a lot of time. I know that we are all busy and with Google Forms you can do more in much less time. Good luck creating more Google Forms! How do you add media to the questions on the form. I can’t quite figure it out. Thanks! Just figured it out. Thanks! Glad you got it all sorted out. Let me know if you ever have any ither questions. Good luck making your Google Forms! I’m an elementary PE teacher in a school system that provides students on this level with one PE period a week. Needless to say, I would feel guilty to use the class time for paper/pencil or computer assessment. I don’t use paper/pencil assessments anymore. I use Google Forms only with 4th and 5th grades. This year I used it for pre and post assessment of fitness unit, overhand throw, and leadership styles unit. I used student recess and my lunch time for these assessments since the trip to computer lab and process of log-in, accessing assessment on my website, and completing it takes 20-30 minutes. Of course, this time period is not sufficient for a couple of students in most of the classes due to their academic limitation, or lack of working computers. After a couple of weeks I just give up to assess every student. I’m trying to brainstorm to find better time for Google Form assessment of my volleyball unit, thought about the station format with laptop computer assessment on one of the stations. Any other suggestions? I find Google Forms very convenient and easy way of assessing the student knowledge. One of the best blogs I have seen on Google Forms. Thanks for sharing Kymm. I appreciate your feedback and hope it helps you implement some of these tools into your classroom! Wow… what a great post! Unfortunately, I found this article too late – I already found the answer on another service. Just look at the service http://goo.gl/0slkSs Its pretty easy to use. I think you can get a free trial if you ask for it.